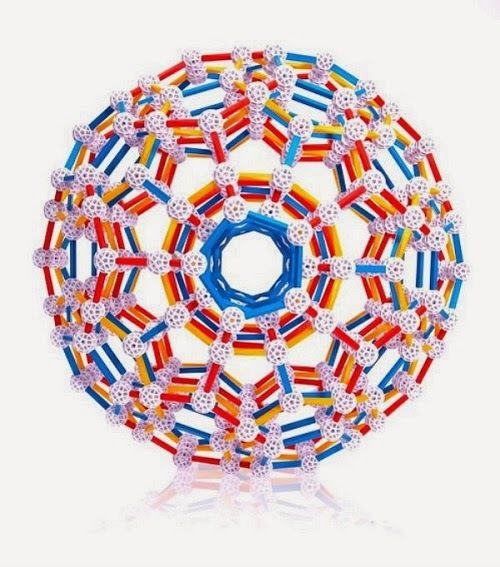 So this is not a toy but it is definitely for kids and it is definitely a tool. I have long hesitated on this idea. I don't see too many plant kits available but the first thing I thought to myself was, "What ever happened to soil +seed+pot?" 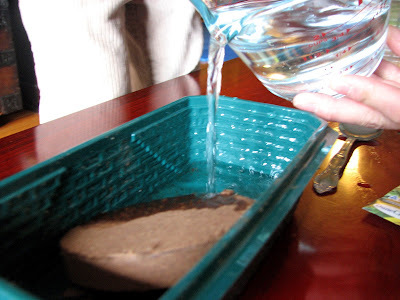 Why do we even need a kit that comes with a concentrated soil disc? Is that even natural or even necessary? My answer now is: Definitely. Getting the kit disc means you are going to have reliable healthy soil and you don't have to measure! Woo-hoo! This part is so easy for the little ones. Nothing is glass. Everything is plastic. No need to worry. The best part. They see these all the time because their gerbils eat them. 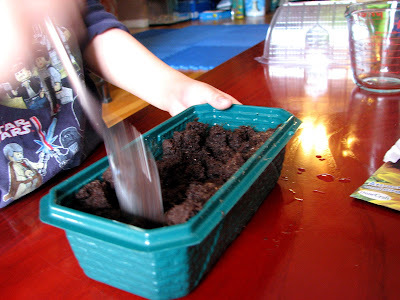 For those of us whose children do plant on a regular basis, we might be used to what is good soil and good gardening conditions but for those of us who have committed involuntary plant-slaughter, we need kits! Kits are brown-thumb friendly. 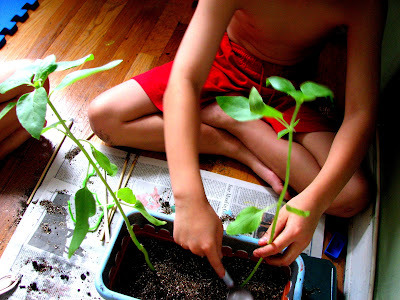 Good kits will not disappoint kids and the Grow Your Own Sunflowers Kit definitely pleases. But you have to be involved and you'll be thankful for it because you don't want to miss out on this opportunity to teach kids how to care for fragile things. This plant is a wonderful way to teach them about what I think are core lessons in life. After all, we are talking about life here. We had NO living plants in our house for the longest time. I stopped trying after a while. It's hard when you live in an apartment with little space. 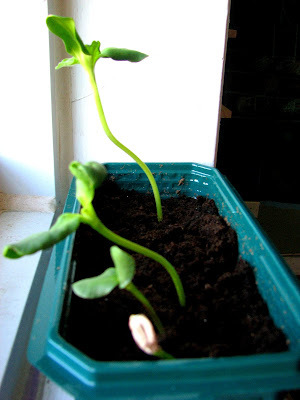 But the sunflower plant kit is small enough to fit on a windowsill and so I decided to try it out in our home. The kids were incredibly excited about it. I actually felt bad seeing their excitement because they loved it so much and plants have not lived in our home for long time. But after we planted the seed, the funniest thing happened. We planted six seeds and only 2-3 of them sprouted around the same time. They were supposed to stay within their dome together and then we were supposed to take the dome off but that wasn't possible because the older plants were starting to touch the top of the dome and so while it was best that the sprouts stay within the dome, we had to uncover it in order to save the tallest one. They don't always grow at the same time. Perhaps this is more human error? Can you believe they sprout with the seed still on top? That's incredible. For a minute there, I was frustrated. Why can't they grow at the same time? My kids kept asking me, where the other sprouts were and I realized that this was the lesson we were supposed to be learning. When it comes to life: we can't control everything. Everything has its own timeline. 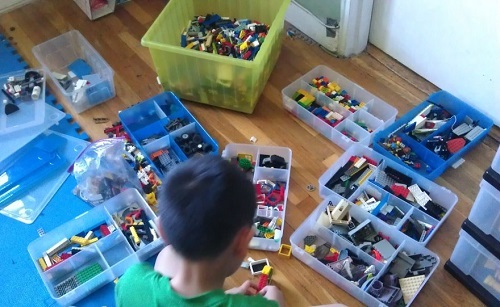 To be sure, I made sure that the kids understood that there were lots of things that we could control. The first was to be gentle with the young sprouts. We managed to ruin four of the six sprouts. You can't help but want to touch them but they are so fragile. The plants started wilting as well which is a sign that they must be moved but I wasn't ready. Thus, this invited some problem-solving for all of us. I wanted to show them that while it is okay that we "broke" our plants, we can try our best to ensure the remaining plants' safety. I taught my kids about "tying" plants onto sticks to keep them upright. I don't know if this was the right thing to do but it seemed like it and we used pipe cleaners and disposable chopsticks to keep our sprouts up. 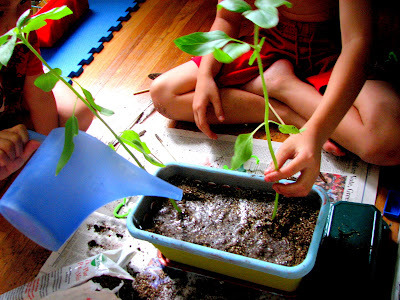 Kids love watering things. Wish they would love cleaning up. Then, Number 1 and I looked for the right sized pot for them. Number 2 and I painted our ugly plastic pot from the dollar store. (Tip: do not use dollar store soil. What a difference from the soil disc we got from our kit- so embarrassed now- but it is too late!) We do plan to move it to a garden eventually but we wanted to keep it home a little while longer. Then I realized, ohmigosh, I do not know how to transfer a plant! We watched a video on YouTube and then the kids went to work. This seems to be their favorite part. Yes, it does get messy and yes, I was afraid that one of plants would be killed in the move but I had to let my oldest try. Since I made him watch the video THREE times, he did get the job done. The plants are still thriving today. I love how they look closeup. You can see the symmetry and understand why kids like drawing plants. While they have definitely learned they can't control everything (at least with plants), I think that the no-control-component is really part of the joy. 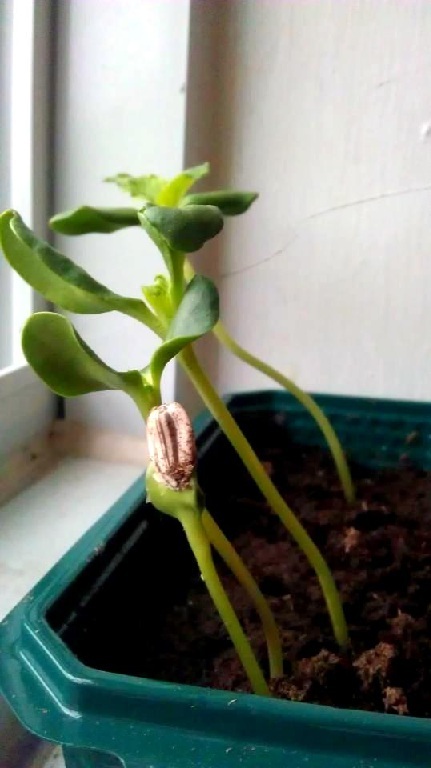 They were so excited whenever they noticed a change, whether it was a new sprout or whether it got taller and our little guy even worried a bit even when one of the leaves started browning. If they hadn't done the planting themselves with this easy-to-start kit, I don't think they would have been as excited or perhaps even noticed. They had to have ownership of this plant. 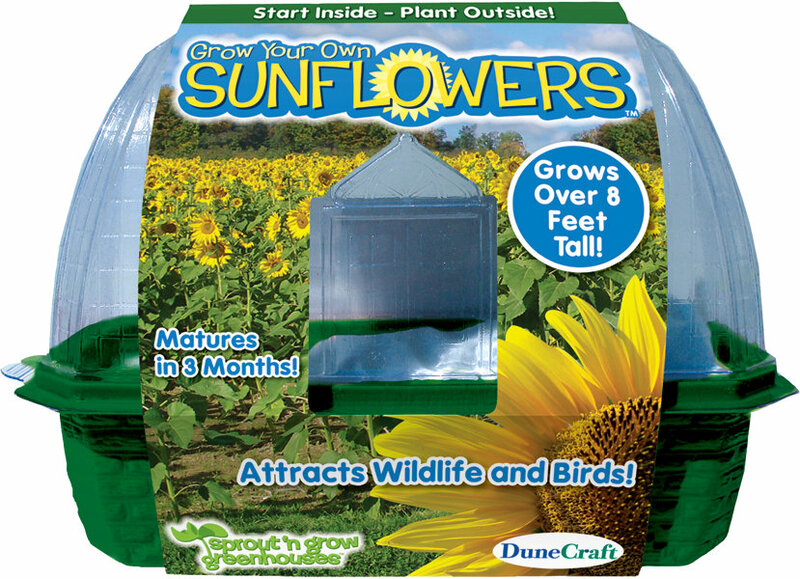 If you're seeking to introduce an easy-to-start make project that requires problem-solving and work (watering, replanting) along the way, this sunflower plant kit does gives a great amount of challenge. As I watch our plants continue to grow, I happily recommend this kit. We can't wait to meet our sunflowers. That will be an exciting day. 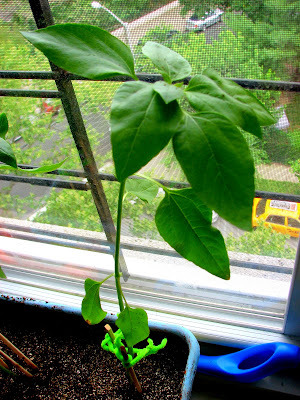 A sunflower grows in a city apartment. I don't know what Number 1 is trying to with his Whisperphone Duet - something about tracking the movement towards the sunlight. The plants definitely do that. Now It's Time to Win Your Own Kit! 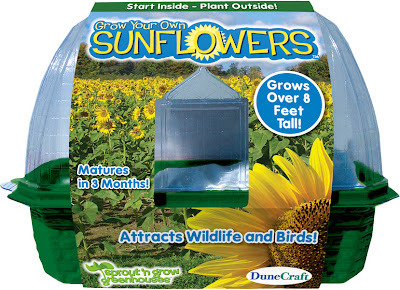 The giveaway ends THIS FRIDAY, 6/29/12 at 12:01 AM because in case you live where winters are cold, you need to plant your Sunflowers soon and now is a great time to do it. This one is for U.S. only- So sorry to my Canadian readers! I will keep trying! 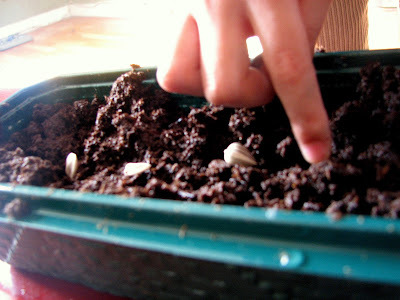 We can't wait to meet our sunflowers. We don't care if it's only two. It could be more someday. Final tip: Save the cover for this kit. The instructions are on the inside. Very eco-friendly- a good lesson for the kids. In case you're wondering..... Toys are Tools has not been compensated in any fashion by the manufacturer or retailer of any of the mentioned products for the publication of this post. 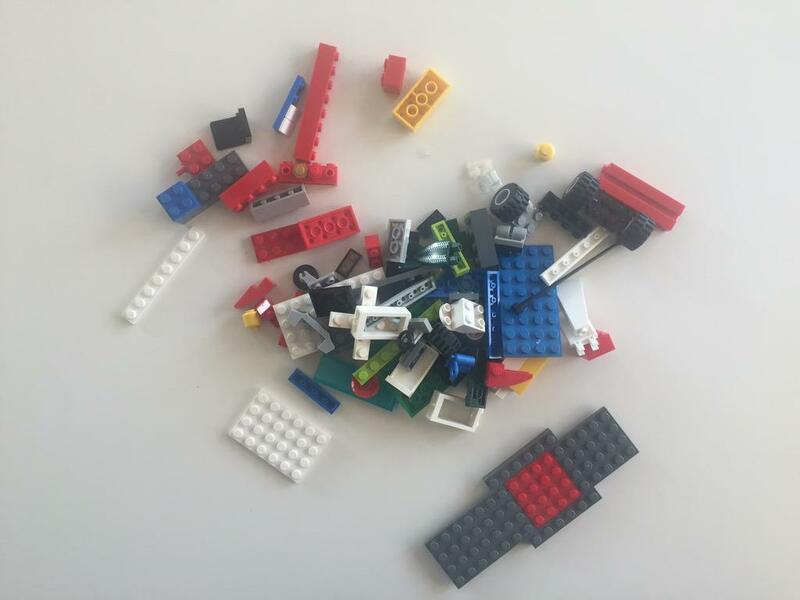 This product was submitted to Toys are Tools to facilitate a review. Reviews are never promised. I've never used a plant kit before. I don't think I've ever even seen one. It looks good. we planted sunflowers in March and still haven't come up. didnt realize the good vs bad dirt issue. I've never used a kit before. I've seen one at Bed Bath and Beyond but I never bought it. This looks great. Micki, one thing I noticed was that the sunflowers seemed to stay nice and cozy in their dome, those first two weeks. The dome was quite steamy. I wonder if that had something to do with it. But yes, I realized that the healthy soil disc probably was key. 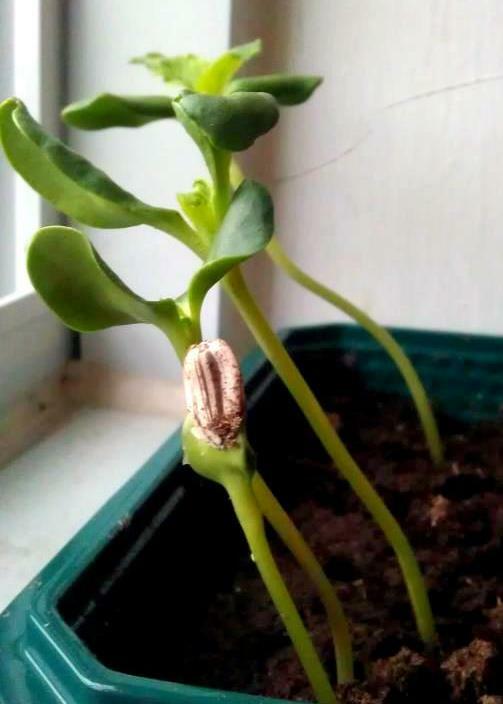 I kill plants often but eventually all six seeds did sprout. Julie, I like how you are just growing something specific here. I can't wait to see them turn into tall flowers. It is supposed to attract birds! We have plenty of them around here. I did see one in Trader Joe's for stevia. They sell Stevia there and I buy it. It looks cool. I have to check again but the stevia kit might also be from DuneCraft too. Having kids grow a natural and healthy sugar substitute like stevia might be really neat. I never thought about how the plant kit could help my son with ADHD. 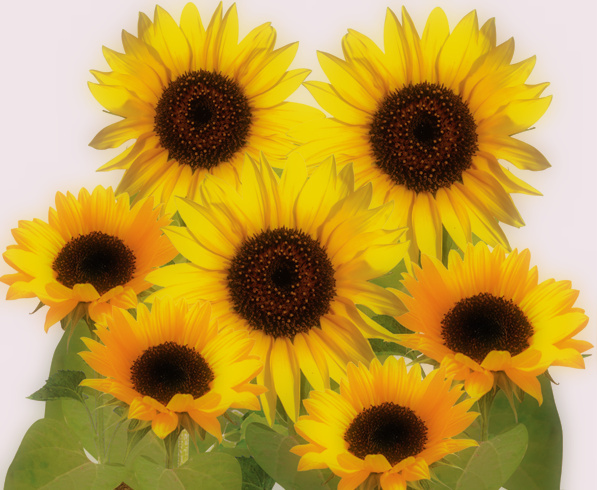 You can harvest the seeds after the flowers bloom to save for next year. We did that with our sunflowers last year and planted more this year without having to buy more seeds. We had so many we were even able to share with the classroom in the spring for their planting project. Plants kits are fun. 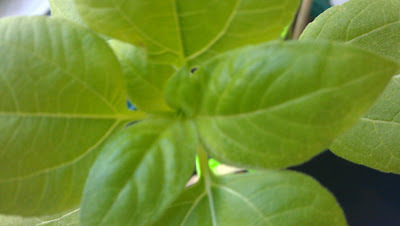 My favorite is the TickleMe Plant Greenhouse i found at http://www.ticklemeplant.com In it you can grow a real TickleMe Plant that closes its leaves when you Tickle It!.